The Journal of Pediatric Research is an official peer-reviewed publication of Ege University Faculty of Medicine, Department of Pediatrics and Ege Children’s Foundation. This publication organ is responsible for the issue of unique clinical and laboratory research papers, case reports, reviews directly or indirectly related to children’s health and diseases. The publication language of the journal is English. The Journal of Pediatric Research does not charge any article submission or processing charges. The abbreviation of The Journal of Pediatric Research is JPR, however, it should be denoted as J Pediatr Res when referenced. In the international index and database, the name of the journal has been registered as The Journal of Pediatric Research and abbreviated as J Pediatr Res. In case of major language revision you can apply to our English Language consultant on editing service. The cost of service is 100 TL per 1000 words. Please transfer the amount to the following bank account and contact the editorial office for further procedures. A manuscript will be considered only with the understanding that it is an original contribution that has not been published elsewhere. All manuscripts submitted to the journal for publication are peer-reviewed. Authors shall be informed within a period of 8 weeks about the process. Upon review, those manuscripts, which are accepted, shall be published in the journal and issued on the http://www.jpedres.org official internet address. The scientific and ethical liability of the manuscripts belongs to the authors and the copyright of the manuscripts belongs to the JPR. Authors are responsible for the contents of the manuscript and accuracy of the references. All manuscripts submitted for publication must be accompanied by the Copyright Transfer Form [copyright transfer]. Once this form, signed by all the authors, has been submitted, it is understood that neither the manuscript nor the data it contains have been submitted elsewhere or previously published and authors declare the statement of scientific contributions and responsibilities of all authors. All manuscripts submitted to the The Journal of Pediatric Research are screened for plagiarism using the ‘iThenticate’ software. Results indicating plagiarism may result in manuscripts being returned or rejected. Experimental, clinical and drug studies requiring approval by an ethics committee must be submitted to The Journal of Pediatric Research with an ethics committee approval report confirming that the study was conducted in accordance with international agreements and the Declaration of Helsinki (revised 2013) (http://www.wma.net/en/30publications/10policies/b3/). The approval of the ethics committee and the fact that informed consent was given by the patients should be indicated in the Materials and Methods section. In experimental animal studies, the authors should indicate that the procedures followed were in accordance with animal rights as per the Guide for the Care and Use of Laboratory Animals (http://oacu.od.nih.gov/regs/guide/guide.pdf) and they should obtain animal ethics committee approval. The Journal of Pediatric Research is an independent international journal based on double-blind peer-review principles. The manuscript is assigned to the Editor-in-Chief, who reviews the manuscript and makes an initial decision based on manuscript quality and editorial priorities. Manuscripts that pass initial evaluation are sent for external peer review, and the Editor-in-Chief assigns an Associate Editor. The Associate Editor sends the manuscript to reviewers (internal and/or external reviewers). The reviewers must review the manuscript within 21 days. The Associate Editor recommends a decision based on the reviewers’ recommendations and returns the manuscript to the Editor-in-Chief. The Editor-in-Chief makes a final decision based on editorial priorities, manuscript quality, and reviewer recommendations. If there are any conflicting recommendations from reviewers, the Editor-in-Chief can assign a new reviewer. The Editorial Policies and General Guidelines for manuscript preparation specified below are based on “Recommendations for the Conduct, Reporting, Editing, and Publication of Scholarly Work in Medical Journals (ICMJE Recommendations)” by the International Committee of Medical Journal Editors (2016, archived at http://www.icmje.org/). Manuscripts can only be submitted electronically through the Journal Agent website (https://www.journalagent.com/jpr/) after creating an account. This system allows online submission and review. The manuscripts are archived according to Web of Science-Emerging Sources Citation Index (ESCI), Directory of Open Access Journals (DOAJ), EBSCO, CINAHL Complete Database, ProQuest, Index Copernicus, Academic Keys, Tübitak/Ulakbim TR Index, TurkMedline, Hinari, GOALI, ARDI, OARE and Turkiye Citation Index. The ORCID (Open Researcher and Contributor ID) number of the correspondence author should be provided while sending the manuscript. A free registration can be created at http://orcid.org. Format: Unique research papers cover clinical research, observational studies, novel techniques, and experimental and laboratory studies. Unique research papers shall consist of a heading, abstract, keywords related to the main topic of the paper, introduction, materials and methods, results, discussion, acknowledgements, bibliography, tables and figures. Manuscripts should be prepared using 12 pt “Times New Roman” and 1.5 line spacing. The text shall not exceed 2500 words. Case reports must contain rare cases or those that are unique in diagnosis and treatment, those which contribute to current knowledge and provide educational information, along with the introduction, case reporting and discussion sections. The whole text must not exceed 1500 words. Reviews are texts in which a current subject is examined independently, with reference to scientific literature. The whole text must not exceed 18 A4 paper sheets. Letters to the Editor must be manuscripts, which do not exceed 1000 words, with reference to scientific literature, and those written in response to issued literature or those, which include development in the field of pediatrics. These manuscripts do not contain an abstract. The number of references is limited to 5. In-text citations: References shall be listed as the below formats on a separate page according to their sequence within the text and referred to within the text in parentheses. References section: All author names shall be stated within all references. References shall be listed as the below formats on a separate page according to their sequence within the text and referred to within the text in parentheses. However, in studies where author numbers exceed 6, names of the first 3 authors shall be stated;“et al.” additions shall be made to the list of authors in English references, respectively. The titles of journals should be abbreviated according to the style used in the Index Medicus. Journal: Last name(s) of the author(s) and initials, article title, publication title and its original abbreviation, publication date, volume, the inclusive page numbers. Example: Koening JQ. Airpollutionandasthma. J Allergy Clin Immunol 1999; 104:717-22. Example: Fletcher CDM, Unni KK, Mertens F. Genetics of Tumours of Soft Tissue and Bone. Lyon, France, IARC Press, 2002. p. 225-419. Example: Whitsett JA, Pryhuber GS, Rice WR. Acuteres piratory disorders. In: Avery GB, Mac- Donald MG (eds). Neonatology: Pathophysiology and Management of the Newborn, 5th ed. Philadelphia, Lippincott Williams & Wilkins, 1999;505-15. All visual materials together with their legends should be located on separate pages that follow the main text. Original documents such as films, ECG records must not be delivered. All cost related to colored printouts shall be covered by the authors’ own expenses. Images: Images (pictures) should be numbered and include a brief title. Permission to reproduce pictures that were published elsewhere must be included. All pictures should be of the highest quality possible, in JPEG format, and at a minimum resolution of 300 dpi. Tables, Graphics, Figures: All tables, graphics or figures should be enumerated according to their sequence within the text and a brief descriptive caption should be written. Tables shall be numbered by Roman numerals (I, II) according to their sequence, and shall include a heading. Figures shall be numbered by Arabic numerals (1,2) according to their sequence. Any abbreviations used should be defined in the accompanying legend. Tables in particular should be explanatory and facilitate readers’ understanding of the manuscript, and should not repeat data presented in the main text. A maximum of 2 figures or photographs shall be added to case reports. The “p” value defined as the limit of significance along with appropriate indicators of measurement error and uncertainty (confidence interval, etc.) should be specified. Statistical terms, abbreviations and symbols used in the article should be described and the software used should be defined. Statistical terminology (random, significant, correlation, etc.) should not be used in non-statistical contexts. Unique research papers cover clinical research, observational studies, novel techniques, and experimental and laboratory studies. Unique research papers shall consist of a heading, abstract, keywords related to the main topic of the paper, introduction, materials and methods, results, discussion, acknowledgements, bibliography, tables and figures. The text shall not exceed 2500 words. Case reports must contain rare cases or those that are unique in diagnosis and treatment, those which contribute to current knowledge and provide educational information, along with the introduction, case reporting and discussion sections. The whole text must not exceed 1500 words. Reviews are texts in which a current subject is examined independently, with reference to scientific literature. The whole text must not exceed 18 A4 paper sheets. Letters to the Editor must be manuscripts, which do not exceed 1000 words, with reference to scientific literature, and those written in response to issued literature or those, which include development in the field of pediatrics. These manuscripts do not contain an abstract. The number of references is limited to 5. Abstract: A summary of the manuscript should be written in English. References should not be cited in the abstract. Use of abbreviations should be avoided as much as possible; if any abbreviations are used, they must be taken into consideration independently of the abbreviations used in the text. Aim: The aim of the study should be clearly stated. Keywords: A list of minimum 3, but no more than 5 key words must follow the abstract. Key words in English should be consistent with “Medical Subject Headings (MESH)” (www.nlm.nih.gov/mesh/MBrowser.html). Acknowledgements: Any technical or financial support or editorial contributions (statistical analysis, English evaluation) towards the study should appear at the end of the article. Case reports should present cases which are rarely seen, feature novelty in diagnosis and treatment, and contribute to our current knowledge. The first page should include the title in English, an unstructured summary not exceeding 50 words, and key words. The main text should consist of introduction, case report, discussion and references. The entire text should not exceed 1500 words (A4, formatted as specified above). A maximum of 10 references shall be used in case reports. Review articles can address any aspect of clinical or laboratory pediatry. Review articles must provide critical analyses of contemporary evidence and provide directions for future research. The journal only accepts and publishes invited reviews. Before sending a review, discussion with the editor is recommended. Letters to the Editor should be short commentaries related to current developments in pediatrics and their scientific and social aspects, or may be submitted to ask questions or offer further contributions in response to work that has been published in the Journal. Letters do not include a title or an abstract; they should not exceed 1.000 words and can have up to 5 references. Commercialization issues shall be discussed with the editor. It is possible to include an advertisement on the outer and inner pages of the journal. All copyright of the journal belongs to the related institutions. 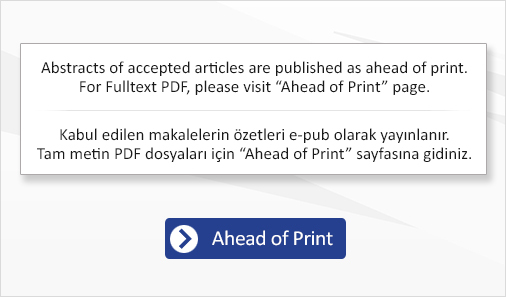 The Journal of Pediatric Research is the publication organ of Ege University Faculty of Medicine Department of Pediatrics, supported by Ege Children’s Foundation (EÇV).